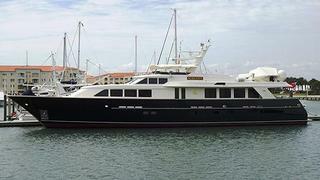 News just in from Wes Sanford at Northrop & Johnson as the 32m motor yacht Serenity has a further $300,000 price reduction. Built in 2001 by Burger in aluminium, Serenity accommodates eight guests in four staterooms and twin 1400hp Caterpillar engines power her to a cruising speed of 16 knots. A notable feature is that her hydraulic mast lowers for access through the canal system to the Great Lakes. On display at the Palm Beach show, Serenity is down from $6,295,000 to $5,995,000.